Royal Hospital, Muscat, Sultanate of Oman. *Address correspondence and reprints request to: Mohammed Al Ghafri, Royal Hospital, Muscat, Sultanate of Oman. Al Ghafri M, Al Sidairi I, Nayar M. Late Presentation of Congenital Diaphragmatic Hernia: A Case Report. Oman Med J 2014 May; 29(3):232-233. Delayed herniation of the abdominal contents through a congenital diaphragmatic hernia may occur beyond the neonatal period. This report describes a 9-week-old female baby who presented with excessive crying, irritability and respiratory distress secondary to late presentation of left-sided congenital diaphragmatic hernia. The chest radiograph showed tension gastrothorax. She underwent surgical reduction of the hernia. She made an excellent recovery and was discharged a few days after the operation. It is assumed that sudden increase of the intra-abdominal pressure caused herniation of abdominal content through a pre-existing diaphragmatic defect. This report aims to increase the awareness of this condition among physicians and pediatric surgeons to allow early diagnosis and management. 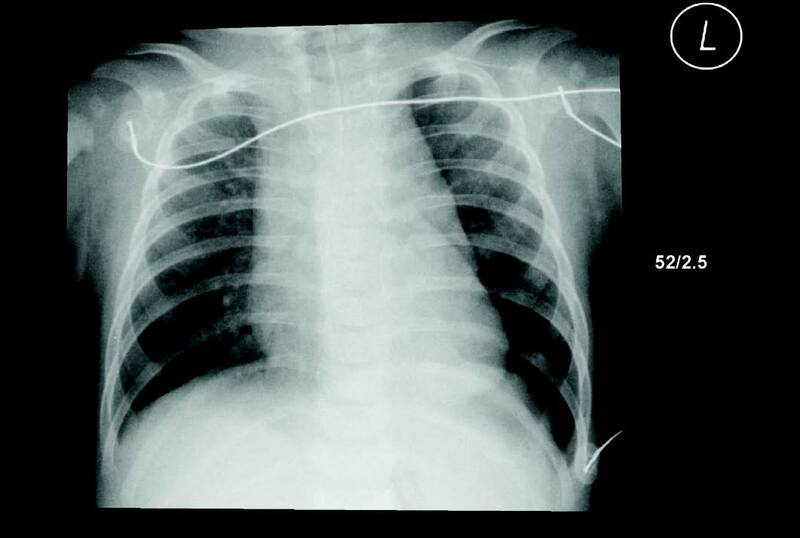 Keywords: Late presentation of diaphragmatic hernia; Respiratory distress; Gastrothorax; Chest radiograph. 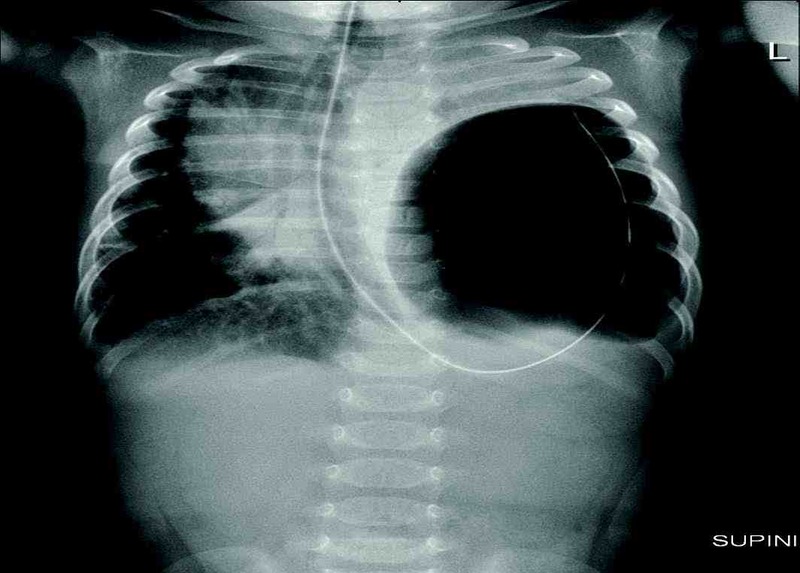 Children with congenital diaphragmatic hernia (CDH) commonly present in the neonatal period with respiratory distress. Late-presenting CDH is less common and the majority present with non-specific gastrointestinal or respiratory symptoms later in childhood. Delayed herniation of the abdominal contents through a congenital diaphragmatic hernia may occur beyond the neonatal period.1 The first case was reported by Kirkland in 1959.2 CDH with mediastinal shift by hernial contents beyond the neonatal period is a rare but potentially life threatening emergency.3-5 For these reasons, late-presenting CDH is quite frequently misdiagnosed. The purpose of this report is to familiarize pediatricians and pediatric surgeons with the clinical presentations that can occur in children with CDH, in order to facilitate early management of this potentially life-threatening condition. Surgical correction has excellent outcome. The prompt diagnosis of late presentation of CDH will reduce morbidities and mortalities. A previously healthy 9-week-old female baby presented to the hospital with acute onset of breathlessness, grunting, irritability and excessive crying of 3 hours duration. Gestational history was unremarkable with birth weight of 3460 grams and normal Apgar scores. She was discharged after 24 hours and remained well at home. There was no history of trauma or fall from height. On examination, she was afebrile but in severe respiratory distress, tachycardic and poorly perfused. She has moderate subcostal and intercostal recession. Air entry was reduced on the left side of the chest and heart sounds were muffled. She required fluid resuscitation with intravenous 0.9% normal saline. Chest radiograph showed a massive gastrothorax on the left side with mediastinal shift to the right side and complete collapse of the left lung (Fig. 1). She was admitted in the pediatric intensive care unit and required intubation and mechanical ventilation. She was taken for emergency surgical correction. Figure 1: Pre-operative image showing gastro thorax with coiled nasogastric tube on the left side of the chest. There was a 2 cm postro-lateral defect in the left diaphragmatic dome with whole of the stomach, transverse colon, and spleen in the left hemi-thorax that was reduced. The left lung was seen well expanded after reduction and the diaphragm was repaired. The baby remained well and extubated immediately after the surgery. Postoperative chest radiograph showed full expansion of the left lung (Fig. 2). The baby made full recovery, and two months later, the baby was followed-up again and was asymptomatic and healthy, with normal growth and developmental parameters. Figure 2: Resolution of gastrothorax with normal lung fields. This case highlights the importance of early diagnosis of the late presentation of congenital diaphragmatic hernia. It emphasizes the importance of sound physical examination, correct interpretation of imaging as surgical correction is lifesaving and curative. All pediatricians and pediatric surgeons should be aware of this condition in their routine practice. The authors reported no conflict of interest and no funding was received for this work. They thank the patient and her family for their cooperation and for giving their consent for publishing this report. They also thank all health professionals involved in the care of this patient. 1. Elhalaby EA, Abo Sikeena MH. Delayed presentation of congenital diaphragmatic hernia. Pediatr Surg Int 2002 Sep;18(5-6):480-485. 2. Krikland J. congenital postero-lateral diaphragmatic hernia in the adult. Br J Surg 1957;47:16-22 . 3. Berman L, Stringer D, Ein SH, Shandling B. The late-presenting pediatric Bochdalek hernia: a 20-year review. J Pediatr Surg 1988 Aug;23(8):735-739. 4. Bagłaj M. Late-presenting congenital diaphragmatic hernia in children: a clinical spectrum. Pediatr Surg Int 2004 Sep;20(9):658-669. 5. Bagłaj M, Dorobisz U. Late-presenting congenital diaphragmatic hernia in children: a literature review. Pediatr Radiol 2005 May;35(5):478-488. 6. Butler MW, Stolar CJ, Altman RP. Contemporary management of congenital diaphragmatic hernia. World J Surg 1993 May-Jun;17(3):350-355. 7. Weinstein S, Stolar CJ. Newborn surgical emergencies. Congenital diaphragmatic hernia and extracorporeal membrane oxygenation. Pediatr Clin North Am 1993 Dec;40(6):1315-1333. 8. Tibboel D, Gaag AV. Etiologic and genetic factors in congenital diaphragmatic hernia. Clin Perinatol 1996 Dec;23(4):689-699. J. 9. Suresh BR, Rios A, Brion LP, Weinberg G, Kresch MJ. Delayed onset right-sided diaphragmatic hernia secondary to group B streptococcal infection. Pediatr Infect Dis J 1991 Feb;10(2):166-168. 10. Manzar S, Nair PM, Nayar M. Delayed presentation of congenital diaphragmatic hernia in association with group B streptococcus infection in a preterm Omani neonate. Saudi Med J 2000 May;21(5):487-489. 11. Fein JA, Loiselle J, Eberlein S, Wiley JF, Bell LM. Diaphragmatic hernia masquerading as pneumothorax in two toddlers. Ann Emerg Med 1993 Jul;22(7):1221-1224. 12. Coren ME, Rosenthal M, Bush A. Congenital diaphragmatic hernia misdiagnosed as tension pneumothorax. Pediatr Pulmonol 1997 Aug;24(2):119-121. 13. Oh KS, Newman B, Bender TM, Bowen A. Radiologic evaluation of the diaphragm. Radiol Clin North Am 1988 Mar;26(2):355-364. 14. Ali R, Ahmed S, Qadir M, Maheshwari P, Khan R. Pneumothoraces in a neonatal tertiary care unit: case series. Oman Med J 2013 Jan;28(1):67-69.